Don't worry I will tell you the best space saving invention later in this article. What are the options for arranging sliding doors on a building? 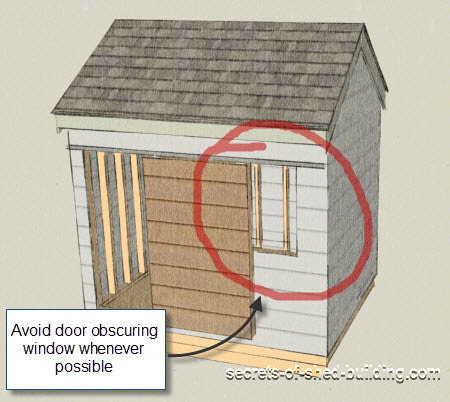 What are the principles of how a sliding shed door works? Where to source the parts for sliding shed doors, or even to build your own sliding door gear? I will also cover a few problems that can arise when installing large sliding doors. The main reason why shed builders choose sliding doors is their efficient use of space. Eliminating the 'swing' space required for a hinged door means that the space in-front of the door has a lot more options. To make the most of this space efficiency a sliding door needs a section of 'free' wall alongside it. This is where the door is 'parked' when it is in the open position. For this reason sliding doors are often installed on the side walls of smaller sheds (rather than the shorter gable end). The picture below shows the two main arrangements. The maximum opening size is just less than half the wall length, but the door has to be offset to one side when one door is used. The door can be located centrally but has to be split in two. This can have advantages, as two individual doors are lighter than one large one. It is also worth having a look at the image below and making sure that the door doesn't clash with any proposed window positions. The size of opening required or lack of space are generally the reasons for choosing sliding doors. But then there are some very nice sets of barn door style hardware that will really do make your shed look great. How do sliding shed doors work? The general principle is that the weight of the door is supported by two sets of rollers per door, which are fixed to the top edge of the door. The best rollers have height adjusters built-in so that you can ensure the door is level. 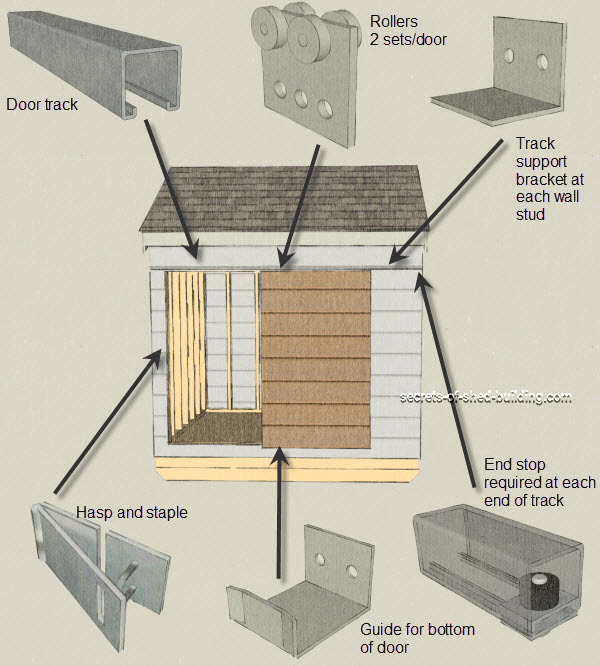 The rollers run in a track which is fixed to the side wall of the shed and runs over the door opening. It is important that the lintel over the opening has enough strength to support the door without deflecting. Otherwise, the door can 'ground out' when it is in the closed position. The tracks for commercial sliding door systems are a channel and the rollers run inside this channel. The channel is supported off the wall and lintel by brackets, at each wall stud position. The run of the door is unimpeded. At the end of the channel a stop is fixed to prevent the rollers sliding out of the end. If the doors are split in the middle then a stop can also be fixed centrally. 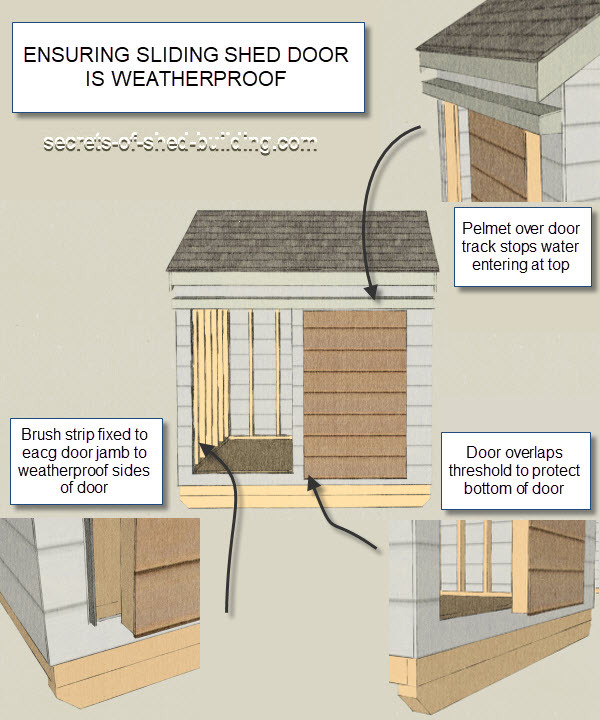 The bottom of the door is prevented from swinging out by rollers, or bracket guide, fixed to the shed wall near the door jamb. With double sliding doors a drop bolt can be used to secure the free end of one door. The doors are then secured to each other with a hasp and staple type arrangement. 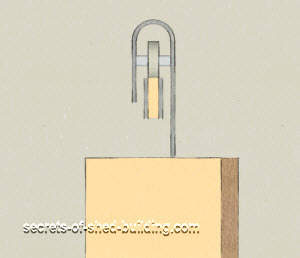 For single doors the 'free' end of the door is secured against the door post with a hasp and staple. By 'right size' I mean that they should be strong enough to support the weight of the door. If the rollers don't have enough capacity then they either won't work or will become damaged and stop working prematurely. If the rollers are too strong the only problem will be that you might pay a bit too much for them. A shed door with a 12mm ply face and timber backing of 4"x2" timber studs at 400mm centres has a weight of approximately 15kg/m2. This gives a maximum area of around 13m2. If the door is 2.2m high then the door could be 6m long. So for most practical sheds of the size discussed on this site then weight should not be an issue for the rollers. What sort of sliding shed door hardware is available? A quick Google search for sliding shed door hardware will throw up a ton of solutions. Many of the products that are shown from this search are for internal use and won't stand up to being outside for long. The sort of product that you need is for use on small farm buildings or light industrial use. The internal style products don't always make this clear. Single sided rollers. These are not suitable for outdoor structures as the door can be lifted off it's tracks. The sort of products to investigate include those from National Hardware in the US and Henderson or Barrier Components in the UK. Unistrut also provide a useful looking set of rollers that work with their almost universally available (and cheap! channels). I have compiled a short list of the type of rollers that would work for this type of project that are available on Ebay. I haven't used each and everyone of these products but they are the brands and type of products that I would be using for a project of this type. Once you have had a look at the commercially available products you might also consider making your own sliding shed door hardware. This article on instructables shows how one shed builder built his own sliding shed door gear, using stock steel plates and roller skate wheels. I like the idea with this project but am not convinced that it provides a great solution or is even that much cheaper in the long run. The door gear encloses the rail so that the door is secure and can't be lifted off. The door must be bigger than the opening to avoid rollers clashing with the support brackets. The door track had to be strengthened as it didn't have enough strength to support the door. With the proprietary channel the supports can be at each stud position without affecting the door movement. The channel is kept small and track deflection is not an issue. The Proprietary rollers are more expensive than roller skate wheels, but not by much. Overall, I prefer the proprietary solution. Even if it doesn't sound as cool as saying you made your sliding shed door gear out of skateboard wheels! 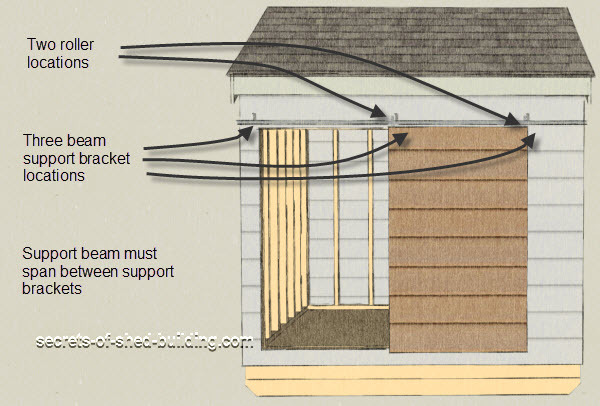 At the head of the door a cover or pelmet is installed to shed water coming from above (see picture below). At the sides, brushes or baffles can be used. The threshold detail will depend if the floor is raised or flush. At the bottom of the door the door should extend past the floor level. For a flush threshold then ensure that there is a slot drain and the outside ground slopes away. The lintel over the door opening needs to be sufficient to support any roof loads and the weight of the door without deflecting. If the beam deflects the door can ground out and stick. This is mainly an issue for larger door openings and longer span sheds. For most of the sheds discussed on this site a pair of 6"x2" timbers should be good for spans up to 3m. With a decent C channel the door can't be lifted off its track. When in the closed position it is held at the bottom two corners by the roller/guide and by the hasp and staple. This along with a strong frame to the door should deter most intruders. Take a look at a few different options to get the solution that works best for you in price and functionality. I mentioned at the beginning that for space saving, the sliding shed door was the second best space saving invention ever. In my opinion, the best is the roll up shed door. It is more expensive and a bit more complex. But it is better in terms of space efficiency as the door is stored at roof level when it is not used. Rather than being parked to one side on the shed wall. Read on to find out more about roll up shed doors. I promise to use it only to send you Shed Building Monthly.